Superman wanders the wooden halls of the Mangal village, learning more about the harsh reality the Mangals faced at the hands of the Trillians. Especially jarring is the revelation that in order to maintain a slave workforce, the Trillians forced a select few Mangals to a life of breeding. Over and over, as the Mangal elder Morgantha explains, the breeding factory tore to shreds the love between mother and child, taking away the baby Mangal to be raised in a life of slavery, while the mother is again forcibly impregnated. Superman is shocked by this, and utters a deep, shaky apology for not having known of the breeding factory and not saving all of the Mangals all those years ago; however, the Man of Tomorrow is unmoved concerning the Trillians: war is not the answer. Skirg cannot accept non-confrontation, insisting justice will be served through combat. A divide is cut between Superman and Skirg at what may prove to be a crucial time: the eve of war. Meanwhile, in the Trillian capital, President Epoq prepares his entire armada. He vows to his people that no Mangal will remain, that they will all perish in rivers of blood. It is the eve of more than a simple war; tomorrow, Armageddon. Story - 4: If someone asked me, "Mo, what is it that intrigues you most about Superman Beyond? ", I'd be like Barry Allen, man, and say in a flash, "It's plot driven." If you don't believe me, just go back and read this arc from issue #15 when Superman is revealed to the Trillians, captured and tortured. 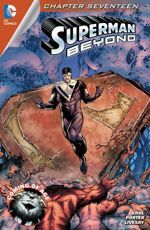 There has been so much depth in the story from that point that Superman Beyond stands on a high pedestal above the rest of the Super Family titles. I've said before that Morrison's Action Comics was my favorite Super title then currently being published, and Superman Beyond was a close second. Morrison is gone now, and Andy Diggle's entry into Action played it a bit too safe, a shade too typical for my liking. Now, Diggle is gone, too, and Tony S. Daniels will finish off the arc. Honestly, I don't care much for Daniels when he's telling the story, but what's worse is during the interim when DC hires a new Action creative team, the scorn of my comic book reading experiences, namely Scott Lobdell will be taking over for an arc. 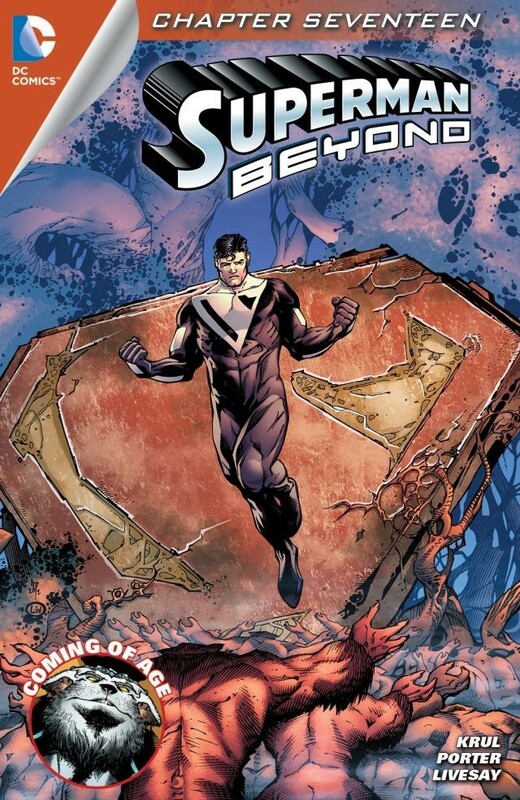 So, I'm going to predict that Superman Beyond is going to rest comfortably on the throne for a while. We'll see what the heavy competition in Scott Snyder will bring to the table. What stands out in this issue is the discovery that the Trillians bred the Mangals in cages, impregnating select females again and again in order to keep a steady workforce. That tore at me. I can think of few tortures as chilling and evil as forcing a woman to have a child, only to have that child taken away moments after birth for the purposes of slavery. Add that a woman is made to endure that over and over and over... It was a bold, terrible element to this story which underscored the clarity and brass with which Krul approaches this title. Few things in mainstream comic books have been as wicked as that, and we need more of it. Another point of brilliance in this story was Superman's unwillingness to concede that war equates justice. Superman wants dialogue, to quell the conflict rationally and peacefully, and not even the horror of what Morgantha experienced causes our hero to falter in his principles. Just the same, I'm aching curious how this will be resolved, especially considering that Epoq is set to unleash a weapon that threatens to destroy all of Trillia. A final note on the Trillians: the contrast between Tyro and Epoq is bound for a massive headbutt. That Tyro refuses to take on the mantle of hero, and seems to be questioning the history he was told to believe is setting the stage for conflict with Epoq. Like I said before, I like Tyro and do hope Epoq's comeuppance comes by his hand. Art - 2: Howard who? Things are a little better this month, but I'm still not satisfied with all this mailing-in that Porter is doing. Cover Art - 3: Ultimately, this is a great cover, but it suffers from Porter's lazy hand. The concept is sharp though. I dig.